A new job has brought me a new mode of transport for my daily commute. No longer do I spend an hour and a half on Merseyrail each day, instead I cycle across Chester (8 miles or 50 minutes a day). This isn’t a novelty to me, we lived in Cambridge for nearly 10 years and everybody cycles there. Although I passed my test many years ago, I don’t drive. So when it came to my new job cycling was the obvious way to work. Some people take the bus but for me that would mean one bus into the centre of town and one bus back out again – it’s quicker to cycle. I’m a cycling commuter, rather than a dedicated cyclist who dons lycra and takes up a fancy road bike for the cycle to work. I wear a running top and cycling windproof but work shoes and trousers. The greatest innovation since my Cambridge days is the “transformer panniers” which convert from panniers to rucksack, ideal for day trips to London when I cycle to Chester’s main station. I treated myself to a new bike for the commute – a Rayleigh Loxley – cost equivalent to 3 months of Merseyrail travel to Liverpool. I get wet surprisingly infrequently, I’ve flipped between shorts and rainproof trousers for rainy days. Winter rain on bare legs gives one an expensive-spa tingling sensation. I find waterproof trousers a bit clammy. Snow and ice haven’t been a problem this year. My dad was a life long cycling commuter, and recommended keeping a full change of clothes at to work in case of unexpected rain. I try to be as visible as possible, my jacket is acid green – slightly short of full high viz, I have a high viz helmet cover, two sets of lights front and back and lights on my spokes. I considered going for the super-blingy spoke lights. I’m well catered for at work, whilst car drivers are squeezed into a space which seems to be 25% too small, I have a bike shed pretty much to myself except for an occasional motorbike and at most two other bikes. Not only that my bike is guarded through the day by a steady stream of smokers! If I wanted I could have a shower. Amongst my colleagues I’m viewed as something of a novelty, of the 100 or so people on site I’m the only one who cycles regularly and there are rarely as many as three bikes in the shed. A few people have asked about my ride, their main concern seems to be safety. I’ve found optimising my route has taken a while. 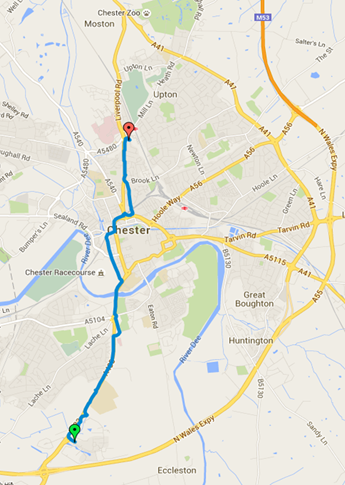 There’s a chunk of cycle route on the way out of Chester towards the Business Park, that bit’s fine. The route expires shortly before I reach my destination which is inconvenient, cycling three sides of the Business Park to get to my office seems excessive and it’s on dual carriageway with poor crossings – there is no cycle route. The piece of the road out of town which gets me fairly directly to my office is a bit narrow, as is the fragment of pavement that I’d need to traverse. A twisty path across the end of the Business Park is clearly not designed to cycle, and is unlit with an awkward gate at the end. A rather lovely looking route along Duke’s Drive is blocked at the Business Park end, this is a pity. The rest of the route is more a case of finding the quietest roads, cycling through the town centre is not great – it’s cobbled, has a one way system and the pedestrians dodge backward and forward unpredictably. The pavements on the Grosvenor bridge are a bit too narrow, and the roadway is too. So you either menace pedestrians or have large vehicles itching to get past you. It seems my cycling is more reliable than driving, two or three times in the last few months a large fraction of the people I work with have been held up by up to an hour by traffic. The only thing I really miss about the train is the lost reading time.